Me | Rani Baker Digs You. Hi. I’m Rani. I am currently (as of 2018) one of the Staff Writers at Macaulay Culkin’s website Bunny Ears. I make weird music and art and sometimes write stuff that is funny or at least packed with obscure facts and research. I write and or have written for several venues, which I will list in a moment, and through them have been quoted in Ms. Magazine, The Nation and Indiewire. I also create oddball video games which you can sample on my (Itch) and (Gamejolt) profiles. Maybe you’ve already stumbled across some of my stuff. I want a chance to take it more seriously, and I hope you want to help out with that. Thanks for viewing! I’m most consistently recognized as the frontperson of the band Destroyed For Comfort (which in 2016 released the Negativland-eque concept album Gender Identity Witch), creating the comic book Why I’m Not An Artist in the 90s (which is now a sporadic webcomic and dork culture blog), and slightly less so for the video games Never Go To Work (which was received well on Boing Boing) and Lithium (which got the attention of PC Gamer) and Death Sword (which won “most innovative” at the 2017 Intel Buzz Gamedev Showcase). I’ve written multiple pieces for Cracked, Harlot Media, Transadvocate, Grunge, Looper, as well as the educational resource publisher ABC-CLIO and a handful of other places, and have been quoted/interviewed in the Daily Dot, Flunk Rock, TransEthics and Original Plumbing (amongst others). You can also purchase zines I have put together for myself or other venues on the Gumroad store. 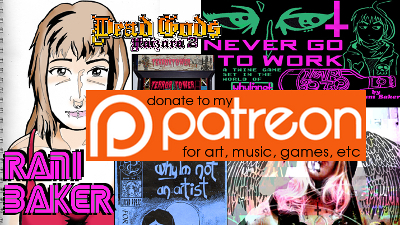 Between Bandcamp, itch.io, and Gumroad there are opportunities to directly support my work you most enjoy if you find crowdfunding distasteful; this profile is here to provide me some breathing room (and groceries and such) as I navigate freelancing my creative labor. Hopefully by the end of 2018 I hope to have games up on Steam! I have a Patreon here if you want to help out. My name is Laxmikant and I represent a group of professional QA testers, having experience of over 1000 Games and Apps on all major platforms. With your permission, I would like to share our portfolio with Destroyed For Comfort team.